In Professor Roberto Morandotti's laboratory at INRS, researchers were able to create and manipulate intense ultrashort pulse patterns, which are used to generate a broadband optical spectrum. In recent years, the development of laser sources featuring intense and ultrashort laser pulses that led to the Nobel Prize in Physics in 2018 along with ways to spatially confine and guide light propagation (optical fibre and waveguides) gave rise to optical architectures with immense power. 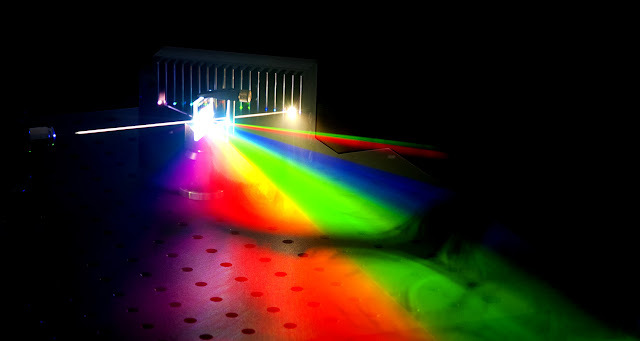 With these new systems, an array of possibilities emerges, such as the generation of supercontinua, i.e extended light spectra generated through intense light-matter interactions. Dr Benjamin Wetzel (University of Sussex), the principal investigator of this research led by Prof. Roberto Morandotti (INRS) and Prof. Marco Peccianti (University of Sussex), demonstrated that diverse patterns of femtosecond optical pulses can be prepared and judiciously manipulated. "We have taken advantage of the compactness, stability and sub-nanometer resolution offered by integrated photonic structures to generate reconfigurable bunches of ultrashort optical pulses," explains Dr Wetzel. "The exponential scaling of the parameter space obtained yields to over 1036 different configurations of achievable pulse patterns, more than the number of stars estimated in the universe," he concludes. With such a large number of combinations to seed an optical system known to be highly sensitive to its initial conditions, the researchers have turned to a machine-learning technique in order to explore the outcome of light manipulation. In particular, they have shown that the control and customization of the output light are indeed efficient when conjointly using their system and a suitable algorithm to explore the multitude of available light pulse patterns used to tailor complex physical dynamics.